Better buckle up. Volatility is back on Wall Street. On Monday the Dow sunk a record 1,175 points. Tuesday started off scary, but the index ended the day up more than 500 points. 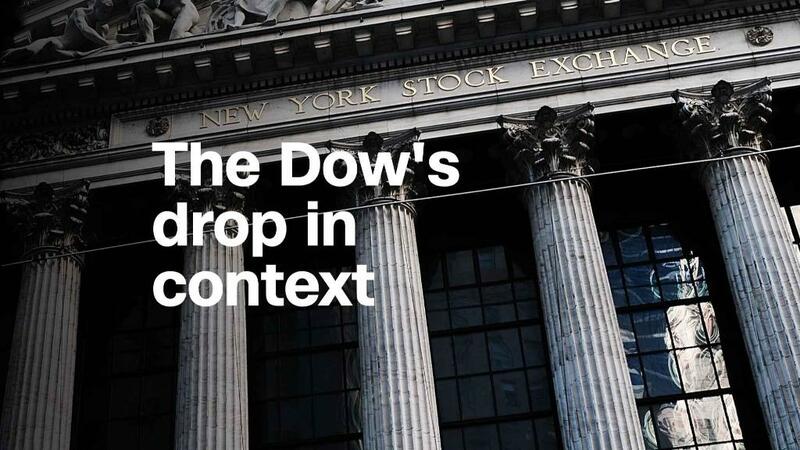 Thursday was another wild ride with the Dow plunging more than 1,000 points. The wild gyrations can be scary for individual investors, particularly those that haven't been investing very long, and aren't used to seeing stocks go anywhere but up. But that doesn't mean you should be spooked out of getting into the market. "No one likes to lose money," said Eric Roberge, a certified financial planner and founder of Beyond Your Hammock. "But it's important to take a long-term view and not make decisions in short-term volatility." The stock market has been on an epic run, with the Dow racing 25% higher in 2017. People have gotten used to seeing their 401(k)s flourish. Although a massive market drop can be attention-grabbing, it can also present a buying opportunity. "The stock market is the only place I've ever seen where when something goes on sale, no one will touch it," said Scot Lance, managing director at Titus Wealth Management. "But if the price is going up, that is when everyone wants to buy it." More tangible assets like real estate can be appealing for some people and help with diversification, but Roberge pointed out they likely won't bring the returns that stocks can over the long term. "If you look at the long-term results of owning a single-family home in the suburbs, the gains on average aren't great, maybe around 3%. And if you take out inflation, it's less," he said. "If you have a long-term time horizon, the stock market is going to produce better results based on history." Experts said the key to investing in the stock market is to have a plan: Calculate how much you can afford to invest, set a goal and timeline and determine your risk tolerance. The earlier you start investing, the more time your money has to grow. If you are saving for something that's still decades away -- like retirement -- it's easier to ride out stock market downturns. Michael Bonnet sees Wall Street's recent fluctuations as a buying opportunity and plans to invest $500 in his IRA on Friday. The sophomore at St. Mary's University recently opened up the account after turning 18. "With a correction or crash, you can get investments for cheap," he said. He is currently invested 100% in stocks. For people already in the market and worried about their money, now is a good time to evaluate your portfolio and make sure you're still comfortable with your asset allocation. Stocks are more volatile than bonds, but tend to bring greater returns. Keep in mind that a 4% drop in the Dow doesn't mean that your portfolio also took the same-sized hit. "If you are properly diversified, your portfolio is not doing what the market is doing," said Roberge. Are you nearing retirement and worried about what the recent stock market volatility means for your 401(k)? Share your story with us.